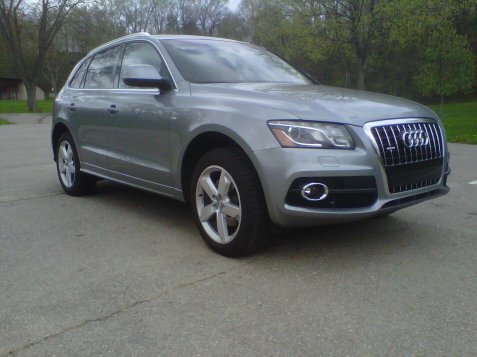 The words “Oh my goodness” come to mind when you take a look at the 2014 Audi 8L TDI Quattro Tiptonic. That’s not just the first glance either, because it impresses time and again before you even drive this beautiful machine. The long wheelbase extends this marvel, as the A8 embodies premium and functional design, progressive technology and advanced engineering and performance. If you are okay with the “wow” factor, then keep an eye on the 2014 Audi 8L TDI Quattro Tiptonic when searching for your luxury sedan. The Audi A8 flagship sedan exudes modern elegance, luxury and dynamism. With its sweeping lines and uniquely bold Audi Singleframe grill with angled corners and horizontal chrome struts, the A8 delivers a striking visual statement. New for 2014, the Audi A8 Premium package option as tested includes powerful yet efficient full LED headlights that give the A8 a distinctive and unmistakable Audi appearance. Also featured on our test model were 20-inch, 10-spoke wheels that literally light up the road. The understated luxury actually makes more of an impression than some rivals that go out of their way to get noticed. Inside, the spacious A8 features meticulous craftsmanship and modern yet functional design elements. A new Premium package for the A8 3.0T, 4.0T and TDI includes 22-way front seats with ventilation, making any long drive enjoyable. Ventilated and massage rear seats have been added to the Rear Seat Comfort plus package for the long wheel base 3.0T, 4.0T and TDI models, which can be combined with the diamond stitch interior of the Luxury package. The interior space is endless and the rear leg room is just ridiculous, as some limos could get jealous from what the 2014 Audi 8L TDI Quattro Tiptonic offers. Luxury is at your every turn with heated 18-way power front seats with memory, four-zone automatic climate control, power rear window and rear side window sunshades, Audi parking system and high-tech rearview camera and extended leather package. The 2014 A8 model line is equipped standard with the award-winning infotainment system, Audi connect. 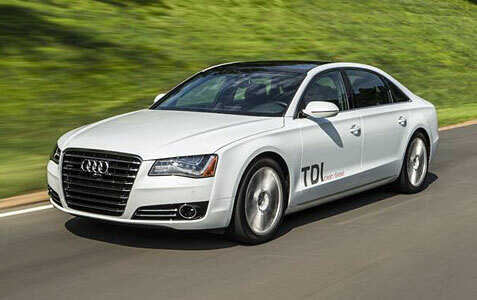 Audi was the first global auto manufacturer to offer factory-fitted in-vehicle Wi-Fi connectivity for passenger use, enabling the Audi connect system to deliver connectivity to up to eight wireless devices. 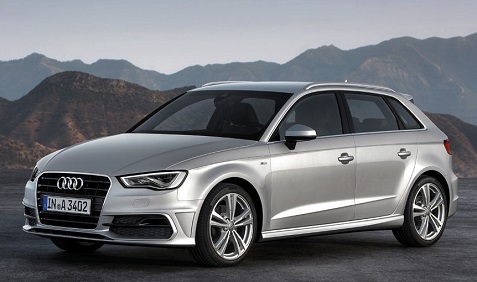 With Audi connect – offered complementary for six months and available for as little as $15 per month thereafter – the onboard Audi MMI Navigation system is enhanced with Google Earth maps for a true aerial view of the route. Audi connect also features real-time localized weather, news and live fuel prices; Google Voice Local Search for detailed information about travel destinations, such as restaurant or hotel hours, pricing and customer reviews; and the myAudi Destination feature, which allows users to log on to Google Earth from virtually any location in the U.S. and download up to 50 destinations to the vehicle. Audi also offers real-time Sirius XM Traffic information via enhancements to the Audi MMI Navigation plus system (active Sirius XM Traffic subscription required). The 2014 Audi A4 Quattro Triptonic is a winner in the mid-size class, packing a lot of punch while delivering the steady good looks expected of the car maker. In top form both in terms of looks and technology, it stands out with its sporty, yet balanced character. The dynamic styling of the 2014 Audi A4 Quattro catches your eye from the moment you see this car with the 18-inch, 10-spoke RS design wheels, Audi xenon plus lighting with LED DRL tail lights and aluminum window surrounds. The distinctive design details – such as the stainless-steel underbody protection, the single-frame grille with vertical chrome bars and the range of wheels – underscore its strong character. The ice silver metallic paint was gorgeous and just seems to fit this car perfectly. Audi’s interior keeps getting better and better while obviously chasing perfection. The interior of the Audi A4 features all of the classic strengths of the brand’s uncompromising workmanship, finely coordinated colors and materials and logical, intuitive controls. The Audi A4 offers luxurious climate-controlled comfort seats for the driver and front-seat passenger. Small fans provide three-speed ventilation to the seat cushion and back. The trunk has a capacity of 16.95 cu ft. Capacity with the rear seatbacks folded down (a standard feature in the Quattro version) is 33.97 cu ft. There is also a wide selection in the areas of communication and infotainment. The versatile MMI navigation plus system can be combined with the Bluetooth car phone online, which connects the A4 to the Internet and brings the tailored Audi connect services on board. Another highlight is the sound system from Bang & Olufsen. Anyone buying a new car is to a large part drawn by the aesthetics of the vehicle. They want a car to look the part and drive responsively, rather than just being a one way ticket to functionality. This is also true when we’re traveling, particularly on business trips.